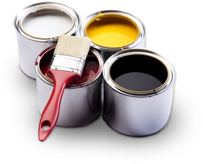 Painting - Painting is a lot more complex than meets the eyes; safety precautions, correct materials, and method of application all need to be considered prior to beginning work. The last thing you want to happen is a botched paint job or ruined furniture as a result of carelessness and impatience. Spray Painting - Having worn furniture can be a real nuisance so finding ways to refurbish it without having to spend money on replacements is a real bonus. Here at GMcolor we provide top of the range furniture spraying solutions for those items that are in need of a fresh new look. Renovation of Kitchen Cabinets - You don’t want to spend hundreds of euros on replacing entire cabinets when it is only the doors that are in need of a revamp. We can provide you with new doors that match your existing kitchen cabinets and other furniture, or create completely new and different ones that make your kitchen stand out. Wallpapering - The way in which we wallpaper is extremely professional and precise; done in a timely manner, of high quality and with no mistakes. If you have existing paper on your walls that needs scraping off then it can become twice the task requiring patience and intricacy, which we pride ourselves on. If you would like to find out more about our painting services then call us on 087 916 2059, or send an email to info@gmcolor.ie. You can also use this price calculator to receive a quick quotation.